Android and Oreo are both looking like smart cookies after the new Android Oreo operating system appears to have given both brands significant perception boosts after its Aug. 21st launch, according to YouGov BrandIndex. Oreo reached its highest perception mark of the year just last Friday, Sept. 22nd, giving it a one-month run so far. Android hit its highest perception mark in a year on Sept. 2nd, giving Oreo the lengthier lift of the two. The co-branding campaign started with a video that parodied the recent solar eclipse (except an Oreo blotted out the sun), and there’ll soon be a run of Oreo cookies with the Android logo on them. 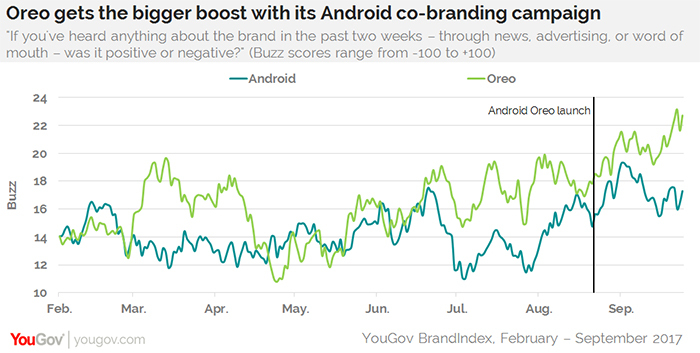 YouGov BrandIndex measured both Android and Oreo with its Buzz score, which asks respondents: "If you've heard anything about the brand in the past two weeks – through news, advertising, or word of mouth – was it positive or negative?" A score can range from -100 to +100 with a zero score equaling a neutral position. From Aug. 21st, the day of the operating system announcement, to this past weekend, Oreo’s Buzz score soared from 18 to 23. Android’s run was shorter and less dramatic, starting with a 15 Buzz score at launch time before rising to 19 on Sept. 2nd then subsiding to its current 17 score.